Our Royal Exchange Square restaurant is located in the heart of Glasgow City Centre, adjacent to the Gallery of Modern Art. The largest of our branches, Royal Exchange Square is a perfect spot for a business lunch, a welcome break from a hard day shopping, or to kick start a night out in the city centre. There is an extensive sun terrace, great to catch the summer rays and can be enjoyed with outdoor heaters in the winter. Royal Exchange Square has private dining facilities which can cater for parties of up to 50, perfect for family gatherings, office parties and conference catering. A very pleasant evening out. 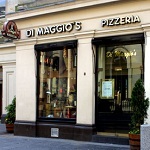 Our absolute favourite restaurant in Glasgow. Lunch or dinner, always excellent. I was very disappointed. It is a long time since I was last in Glasgow so decided to head for one of my old favourites. I felt the restaurant needs updating as the decor is tired looking. The service was incredibly slow so slow we decided against a desert. We had almost finished our meal by the time the waiter brought the Parmesan and our second drink was brought after we had eventually decided to ask for the bill and paid and were in the process of putting our coats on. As I say I was very disappointed and won’t be coming back next time we are home for the weekend. Speedy service, lovely food, pleasant staff. Lovely family environment with friendly staff and great food. Fantastic meal. Great quick service and friendly staff. Another fantastic meal on Saturday. Booked online and asked for a booth which we were given. Service was fantastic also. Wont be long till we're back again. Nice piece of Fillet steak. The ambience is rather old fashioned, we were served garlic bread which was like home cooked toast with garlic sprinkled. The seating is boring and dull. We ordered Penne  Piccante and Penne Pepperonata no difference really only  Penne  Piccante had some peppers the taste was ordinary, would have made a better one at home. Would not recommend to anyone rather go for a takeaway anywhere. Amazing food & service as always! Best fillet steak in Glasgow! Service & food was fantastic as-usual. I always find the staff friendlier on the weekends compared to whenever I dine on a weekday, but that's just from personal experience. Thanks for a lovely meal. Fantastic meal as always! When in Glasgow we just have to visit. Table of 3 arrived separately. GOT SAT SEPARATELY. Signal in the restaurant isn’t great, so took us 20 minutes to realise what had happened, no apology. Food was great but beginning certainly put a dampener on the experience. Great staff, nice food , quite expensive. Staff very friendly and the food is always excellent. Would highly recommend a visit to friends and family. Had a great time there with my friends. Excellent service and great food. Absolutely loved the food! Huge range of options and there's something there for everybody, including great vegetarian options too! Not only was every employee polite and very welcoming but service was extremley quick and easy. I would definitely recommend for those who are looking for a nice dinner out.